Spokane-area universities like Gonzaga, pictured here, are taking a new approach to campus dining. Food is important to Chase Wilcutt, a former 230-pound defensive lineman from Onalaska, Washington, who visited two other comparable universities before selecting Whitworth University, where he now plays defensive end for the Pirates. "I made a chart, actually," says Wilcutt, who liked Whitworth's food and appreciated the unlimited meal plan option, which is called all-you-care-to-eat — versus all-you-can-eat — in the parlance of today's college dining services. It's a subtle yet vital shift in phrasing that represents evolving trends in campus dining, which according to several industry websites includes more diversity in what, when, where and how students can eat, through efforts such as branded dining, ethnic options, to-go locations, local and sustainable dining and increased allergen-free requirements. Regarding sustainability, for example, many area colleges are using recyclable serving materials and maintain a campus garden, including Eastern Washington University, which also composts its food waste. "In some ways, we have to set the standard for students to learn from us in this area," says EWU Director of Dining Services David McKay, who notes that other trends include "convenience, portability, and the words 'nutritious and healthy.'" EWU Dining Services taps a food services committee, plus its 300 to 350 student employees, for feedback on campus dining. Some residence halls have on-site stores, for example, and when it reopens next year, the Pence Union Building will feature a global café and a Panda Express franchise. 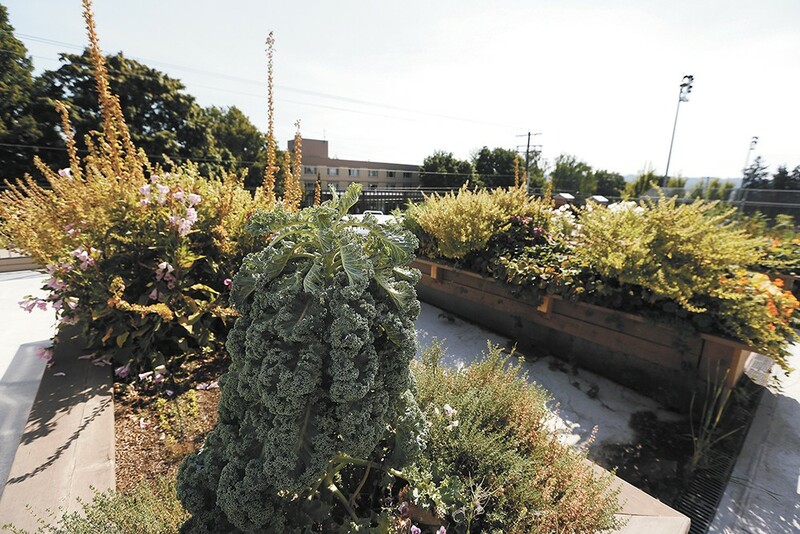 Some ingredients, like this kale served at Gonzaga are even grown on campus. Student feedback also drives some of this decision-making at Gonzaga and Whitworth universities, both of which utilize Sodexo, a multinational food services and facilities management company, to run their on-campus dining services. "We don't determine the meal plan — students do," says Pat Clelland, Gonzaga Food Services' resident district manager. Options are important. Inside Gonzaga's John J. Hemmingson Center, a brightly lit $60 million hub completed in 2015, students enjoy Starbucks Coffee and Einstein Brothers Bagels while lounging on modular turquoise seating, or gazing across Mulligan Field to the McCarthey Athletic Center. The Circulus Omnium Gonzagaorum, aka the COG or Center of Gonzaga, is a hip, multilevel dining facility, more like a mall food court than the old-school cafeterias that Gen Xers may remember. Here students dine on flatbread pizza at Mediterranean Coast, Mongolian-grill food from 360 Degrees, American comfort food at Spike's and global cuisine like Brazilian beef at World's Fare. "They want to feel like they're getting a complete meal," says Clelland, who notes that college dining isn't just about the food: "It's about taking care of the whole person." Spike's, for example, stays open until 1:30 am for students wanting alternatives to off-campus, late-night dining or bars. Other students, however, like the flexibility of using their meal card or "Bulldog Bucks" at select off-campus eateries like Sushi Sakai or Method Juice Cafe. Off-campus students can sign up for Gonzaga's Chopped 4U ready-to-make meal program. The campus dining services' mission, says Clelland, is to ensure that students have access to good, healthy food, however it fits them: "People have recognized [food] is so much a part of a student's success or failure." Indeed, numerous studies have shown that nutrition and academic performance go hand-in-hand, yet there may be another benefit to student dining: fellowship. 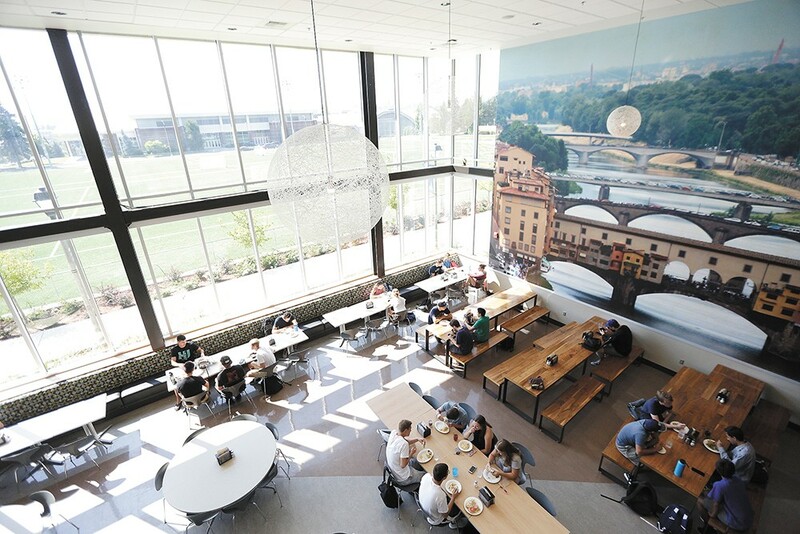 Typically, freshmen and sometimes sophomores are required to have some kind of meal plan, which Jim O'Brien, Whitworth Dining Services general manager, says also promotes community on campus. Adds EWU's McKay, "We have more contact with students than most of their professors, and that's a good thing." Some of that contact includes nutritional counseling, including food allergies, which the Journal of Allergy and Clinical Immunology estimates impacts 3.6 percent of Americans. Eight food items are responsible for most serious reactions — milk, egg, peanut, tree nuts, wheat, soy, fish and crustacean shellfish — prompting Gonzaga to offer what it calls "Simple Servings," an allergen-free station inside the COG that's popular with 60 percent of students who have never self-reported an allergy, says Clelland. Whitworth also works with students to stock their dorms with allergen-free foods; EWU, in addition to going nut-free in its food processing, provides a secure space for students to store specialty foods inside its primary dining facility, Tawanka Main Street Dining. Not all the changes happening in college dining are student-driven; schools are always looking to improve efficiency and reduce cost, says EWU's McKay. Six years ago, for example, Eastern teamed up with Washington State University and Food Services of America to maximize its buying power on several commonly purchased food items. "We basically do the best job for our campuses and our students by using that collaborative model," says McKay. Gonzaga, Whitworth and the Community Colleges of Spokane also collaborated recently in developing the Better Tomorrow Plan, intended to reduce students' sodium intake. Funded by a Centers for Disease Control and Prevention grant through the Spokane Regional Health District, the program empowers the schools to collectively push their vendors for lower-sodium canned goods. That, in addition to all menus listing nutritional information — ahead of U.S. Food and Drug Administration requirements to do so — empowers students to make informed choices, says Clelland, which is the right thing to do.